Important: The tag on the shorts is in Asian Size. Please choose the conversion to US size directly from the following chart before placing your order. US 2 - Tag M: Waist: 25.2"-36.2"--- Hip: 46.5"--- Length: 15.0". US 4 - Tag L: Waist: 26.8"-38.6"--- Hip: 48.4"--- Length: 15.2". US 6 - Tag XL: Waist: 28.3"-40.9"--- Hip: 50.4"--- Length: 15.4". US 8 - Tag 2XL: Waist: 29.9"-43.3"--- Hip: 52.4"--- Length: 15.6". US 10 - Tag 3XL: Waist: 31.5"-45.7"--- Hip: 54.3"--- Length: 15.7". US 12 - Tag 4XL: Waist: 33.1"-48.0"--- Hip: 56.3"--- Length: 15.9". US 14 - Tag 5XL: Waist: 34.6"-50.4"--- Hip: 58.3"--- Length: 16.1". US 16 - Tag 6XL: Waist: 36.2"-52.8"--- Hip: 60.2"--- Length: 16.3". There can be a 2-3% difference due to manual measurement. Suggestion: Compare our product measurements to a similar pair of shorts you already own. 3.The time in the Holiday Season Peak to deliver maybe longer than normal time. This shorts is made of incredibly lightweight, breathable and flexible material. 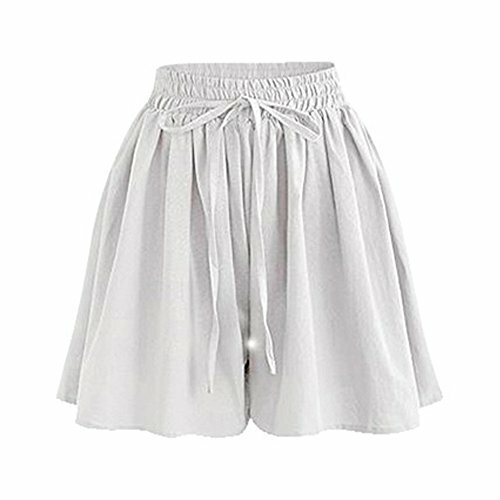 High rise elastic waist with a decorative drawstring, Casual loose fit, Summer Comfort Culottes Shorts. Suitable for beach, lounge, shopping, school, party, workout and daily casual occasions. Machine washable, Low tumble dry, Do not bleach.